It’s Labor Day weekend, hope you all are doing something relaxing and not labor intensive. For me this weekend is the gateway to fall, come Tuesday I give myself free rein to decorate and start enjoying the season…whether it’s officially here or not. 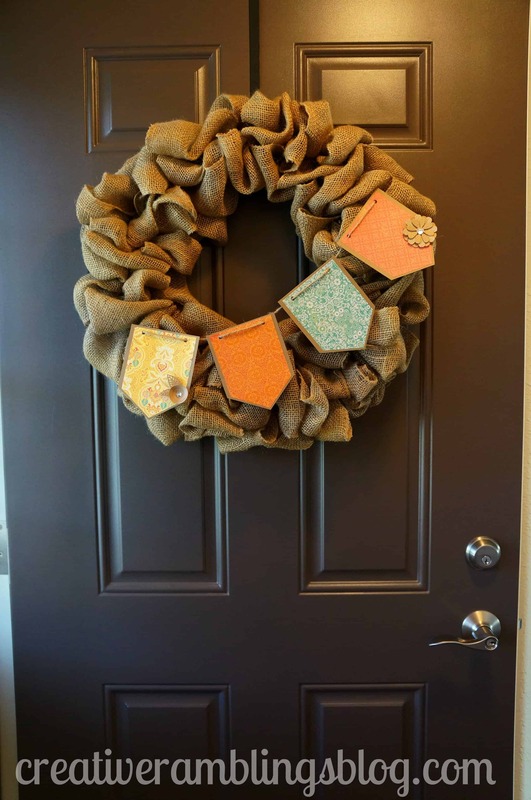 I thought I would get a bit of a head start today by updating my burlap wreath on the front door. I made this wreath over the summer and it was really easy, check out the tutorial here. 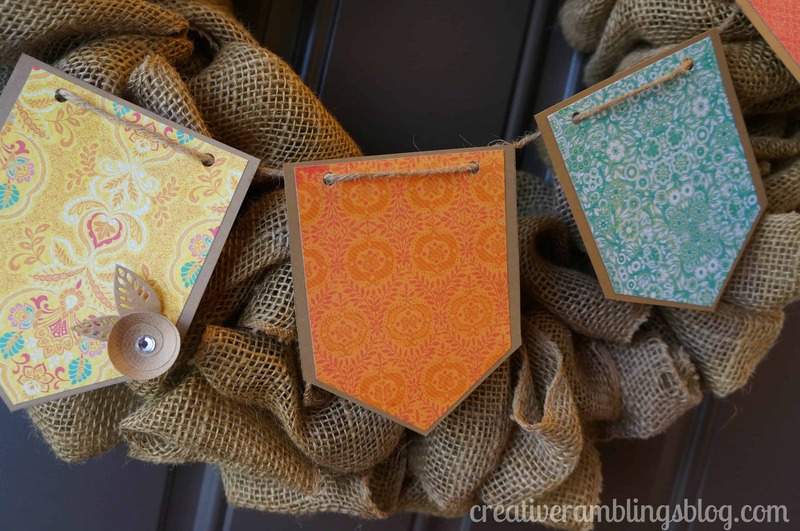 My quick fix for fall is a couple pennants on a piece of twine. I used kraft paper and some fall inspired patterns along with a couple embellishments. I’ll probably change it up come Halloween then again in November. Got to cram as much fall love into this short season as I can. This is so inspiring, I might pick up some mums on Tuesday – woo hoo! What are your feelings on fall? Psyched like me, or bummed summer is coming to an end? Thanks Kayla, I linked up and am browsing other projects now. Cute wreath! 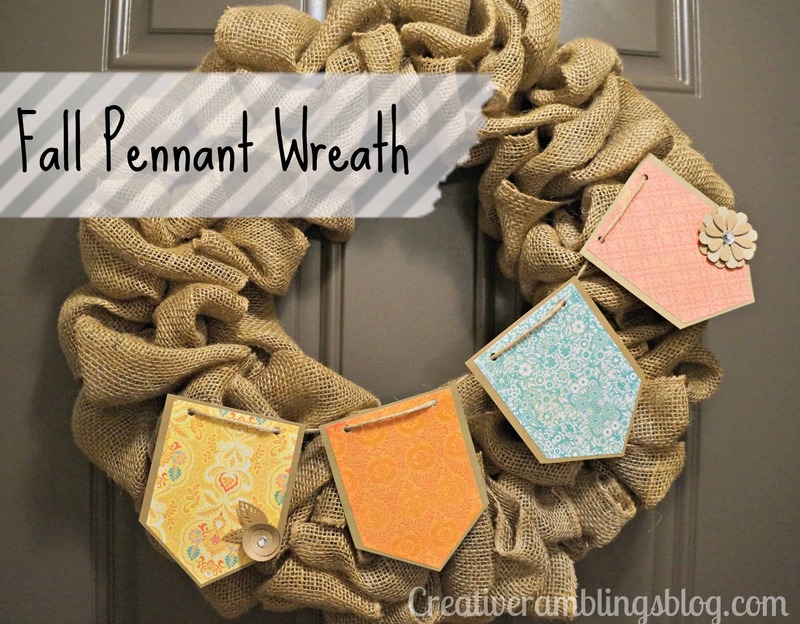 I like the craft paper you used for the pennants. Thanks T’onna. Glad you stopped by. I love the little flower that make the banner, and the cute banner that makes the wreath! Thanks for linking it up at Monday Funday! Thanks Katie, love your party. Thanks for stopping over. I see your finding great ways to use scrapbook paper too! Love this! Those pennants really add the perfect touch. So fun to mix up for different seasons/holidays! Thanks for linking up to our Home Improvement Party! I’ll be sharing this on my FB page! Super cute! Love the idea that fall is here, but only for the weather… although I want my son to be in school, it is so much harder to get everywhere after school, my job just gets in the way, lol. 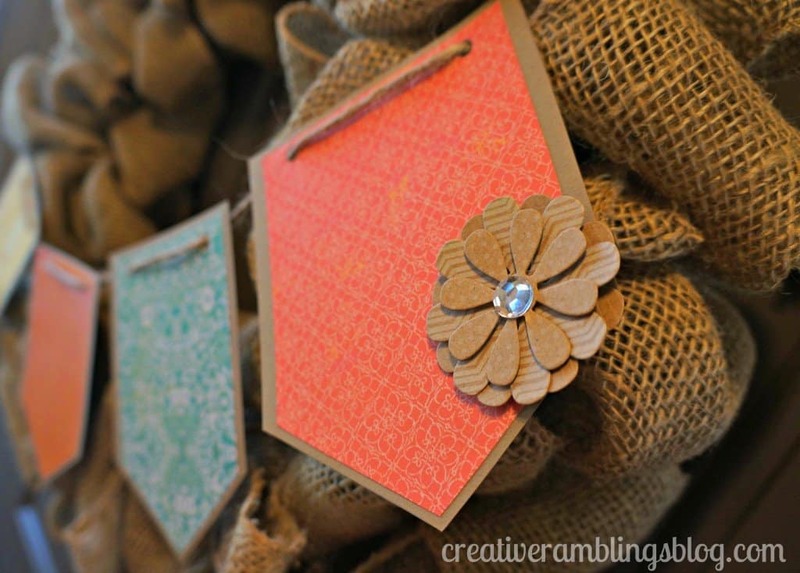 I linked over from the Homemade By You Link Party where I am participating too with Sympathy Card and Free Sympathy Cut File and would love it if you’d stop by. Oh yes the pros and cons of fall! Thanks for stopping by. Thanks Katie, I enjoyed browsing all the great ideas linked up at your party.